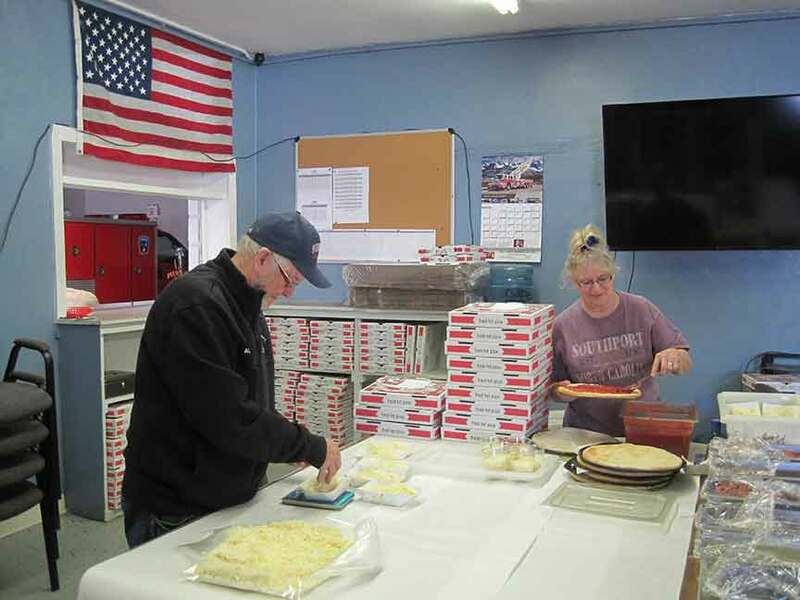 PIERPONT– Stacks of square boxes lined the counters of Pierpont Fire Department’s kitchen area on Friday, Feb. 1 as volunteers busily made preparations for their end of the week pizza nights as held for the community of Pierpont. (From Feb. 8 edition). According to Volunteer Helen Mallory Pierpont Volunteer Fire Department has been offering a pizza fundraiser January and February each year on Friday evenings since 1993 as organized by township resident Janet Brockett, along with herself. In regards to his take on the fundraiser so far this year Marshall said that it has been a little slow but noted how last year was a great year for them and thinks this year’s support may be less received because of the weather. Aside from himself and Mallory, Marshall said that the fundraiser nights often include about 11 volunteers that help out with four or five volunteers pre-cooking during the day and six Fire and EMS at night. Of their regulars Mallory said includes Wanda Williams, Robin Heston, Barb Culp and Janet Woodard. For those unfamiliar Pierpont Volunteer Fire Department pizza fundraisers are held every Friday until Feb. 22 from 4 p.m. until sold out at their location of 6006 Marcy Road in Pierpont. All pizzas are ready to eat (as well as include take-n-bake) for a fee of $8 for a plain cheese or garlic pizza, plus $1 for additional toppings. Topping choices include plain cheese, garlic, along with toppings of extra cheese, pepperoni, sausage, bacon, mushrooms, onions, green peppers, red peppers, banana peppers and black olives for $1 each. Please note that the pizzas are take-out only and must be purchased with cash. For further information about Pierpont Volunteer Fire Department’s January and February pizza fundraisers, to volunteer for the fundraisers/department, or to purchase an ambulance membership please call the station at (440) 577-1190. You can also donate to their Saturday, April 27 Chinese auction or purchase $5 tickets ahead for it by calling (440) 577-1230. Pictured: Alvin Williams and Robin Heston adding cheese and sauce onto pizza dough during Pierpont Volunteer Fire Department’s pizza fundraiser event on Friday, Feb. 1 within Pierpont.